Oh yes. It is that time of year again where I play with exotic citrus. This year I decided to do something different with my Mandarin Kumquats. 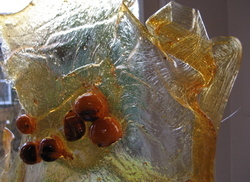 In the past I've candied them, syruped them, and marmaladed them.. but this year I found a recipe for Jellies. I simmered my sliced fruit with some water and then used the resulting juice in the recipe for spiced apple jellies I found in The Craft of Baking by Karen DeMasco. The recipe was straight forward and easy to make, but it isn't mine so I don't feel I can reprint it. I do recommend the cookbook (as I would any cookbook that has a section on donuts, but I digress). The jellies were lovely, but due to my own error (I forgot to add the corn syrup) they weep a little. I do enjoy the tangy, slightly floral taste of the Mandarin Kumquats. Next time I would use more fruit (I only used 5 or 6), and I would juice them before I cut up the rinds. I would also be more aggressive in my simmering. I was worried about bitterness, but I shouldn't have been. No, not more vintage recipes with questionable aesthetic value! New Seasons Market had the most lovely mandarin kumquats, and I was once again smitten. Sure, I still have kumquat syrup and limequat marmalade in the fridge... but they were so pretty, and well.. now I have three kinds of preserved citrus in the fridge. This time I used 1/2 pound of thinly sliced mandarinquats simmered in two cups of water, to which I added 2 cups of sugar. This I boiled to a temp of 223 degrees, so it should gel up nicely. I do have a Plan for this particular jar of goodness (no it does not involve a spoon and standing with the fridge door open), so its time in my fridge is limited. Orange you going to try some? You say you don't like marmalade, try it try it and you will. As a child I didn't like marmalade. I thought it was bitter and nasty. Then, as an adult, I discovered the lovely flavors of kumquats, mandarin kumquats, limequats, etc, and I began to think "Oh, Sam-I-am I do like marmalade, I do! I like it with kumquats, and limequats, and etc..."
This week I picked up a handful of Seville Oranges. You know, the bitter oranges of which traditional marmalade is made. And I made marmalade. 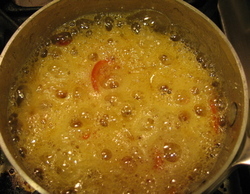 Traditional marmalade. It is lovely, and orange, and appears to be jelling nicely.. but... I have discovered that I still don't like marmalade Sam-I-am. This beautiful, lovely smelling stuff is bitter in a way that after tasting it I had to eat a medicinal homemade marshmallow to rid my pour mouth of the sensation that my tongue was turning inside out. Ya. That bad. Oh, what is it? Is it glass? 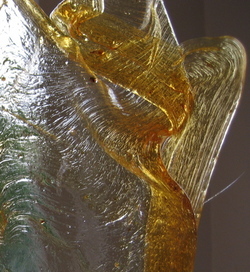 Is it sculpture? This would be what happened when I tried to multitask a bit too much. And so yet another little citrus has met its end. Now, I would point out, that I didn't actually burn the kumquats. There is no charred taste to this sugar glass I managed to make. That little kumquat was crunchy on the outside, and soft and warm on the inside. The sweet outside contrasts in a lovely way with the tangy citrus inside. My mouth is humming with sour, bitter and sweet all bouncing off of each other. I would also add, that compared with the mandarin kumquat and the calamondin, that the kumquat had the least powerful taste cooked. But, the regular kumquat is the only one that I would eat raw (the other two make you think your mouth might turn inside without the tempering of heat.) Of all three, I would have to say my favorite was the calamondin. I am hoarding the syrup that is left from that experimentation. The sun breaks through.. or is that just more citrus? Look! I made a collage! I was so excited last night when the cobwebs cleared and the images started to come together! I have been messing about with ideas, but haven't gotten anything to gel.. until last night. Oh the relief. 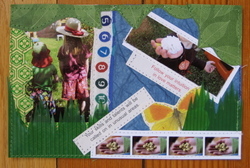 I am doing a mail art swap with the theme of "Where You Live", and this is my first attempt. I tried to do something more literal, but I couldn't get enough color into it. We will see where round two goes. And look! More wee citrus to torture! Traditional kumquats have finally come to town. I am going to try and preserve them whole. 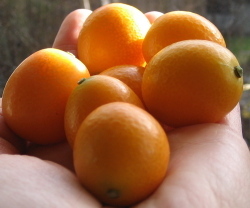 Lets hope for something similar to the calamondins, not the mandarin kumquats. Tomorrow is Friday, and we all know what that means... Big E goes to his weekly doctor date. Today is day 23 of the pneumonia saga. Will tomorrow bring chest x-rays, blood draws, or.. more tests?! I have Big E's sneezy, snotty cold. This is giving me the perfect chance to try my Candied Calamondins. I preserved them about 10 days ago, but never got around to posting them. I used a recipe I found on line. The syrup is amazing! Oh my, just wonderful. 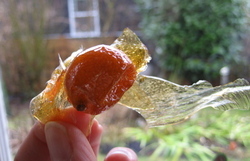 So right now, I drinking a tea made from a candied calamondin to rally my cold-fighting defenses. So I found another cool citrus at my local grocery store. 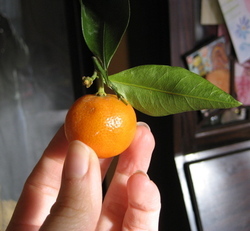 This is a calamondin, or a miniature orange. It is sour, and can be a little bitter. It is supposed to be similar in sourness to a lime, but honestly I haven't been brave enough to bite into it raw. One of the produce gals at the store tried it in front of me, and her face puckered alarmingly. 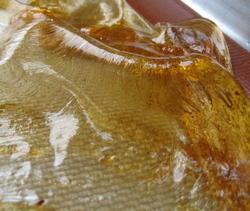 I want to try to preserve some in sugar syrup similarly to No-Sword Matt's recipe. I still have not been able to find any regular kumquats (although I haven't really tried that hard). I will let you know what happens with this lovely little citrus... hopefully there will not be a repeat of the cajun mandarin kumquat. 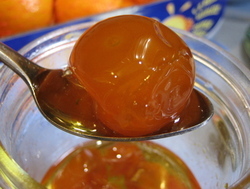 As a side note, my grocery store does carry preserved kumquats in a jar, but really where is the fun in that? Round two of Mandarin Kumquat Battle: Will the fruit survive? I bought two more Mandarin Kumquats today (be scared little fruit...), and made a second attempt at candying them. 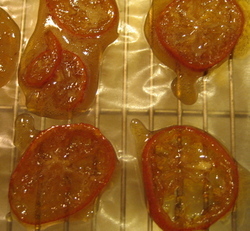 After slicing them, I cooked them in a sugar syrup (1/3 water to 2/3 sugar). I was trying to reach a hard crack stage, but only made it to soft ball. This means that the candied kumquat is softer than I originally planned. 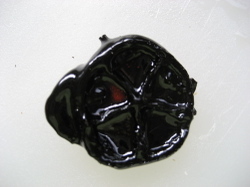 I did not continue to cook it because the sugar syrup was beginning to color (see earlier "color" issue). In fact, as I placed the slices onto the rack the remaining syrup began to turn brown. The candy itself has a lovely flavor with no bitterness. The peel is chewy, but not unpleasantly tough. My only mistake was to put the candy on wax paper instead of my silpat baking sheet. The paper sticks to the soft slices. 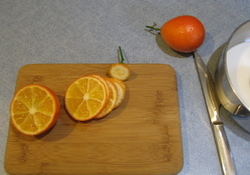 Ok, so I cut into my gorgeous mandarin kumquat. The very juicy flesh has a complex, tart, rich, astringent, beyond orange citrus flavor. 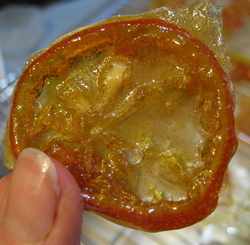 The skin is edible, with very little pith, and tastes much like a kumquat. There were lots of large seeds. It would be the perfect fruit to candy. So I looked up a couple of recipes, borrowed a sugar/water ratio and set to work. 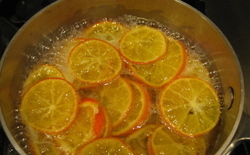 Gorgeous bright orange 1/8" slices went into the sugar syrup, and then Sweetheart G called out (she's home sick with a cold), and whoops just like that I had black tar. Oh well. Once the smoke clears, I'll think about whether I want to actually buy some fruit and start over. What a sad fate for a lovely fruit. Isn't this gorgeous?! I love my local grocery store. When I found this lovely fruit, and asked one of the produce guys "What is it?" 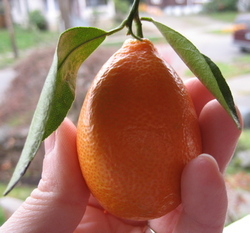 He answered, "It's a Mandarin Kumquat. Take it home. Try it. You can have it." Then he paused and followed up with, "But, I think it's gross." I said, "Do you eat the peel like with a kumquat?" He returned, "You can, but I think its gross either way." I laughed, and put it in my basket to take home. He then called out, "I'm just trying to be honest!" "I know. I appreciate it. Really!" Generosity and honesty. What more could you want? A checker who asks about your children? No. A fleet of checkers who ask about your children? You got it! Oh, and checkers who give your child the 3rd degree when they come into the store with a different adult. "That's not your mom. Who is that? Where's your mom?" Did I mention that they also deliver? Ah, bliss.